Mikhail Yurievich Mandelshtam is a Senior Research Scientist in the Institute for Experimental Medicine, St.Petersburg, Russia. He is the only specialist in taxonomy of the Scolytidae in St.Petersburg, intensely working with them as an amateur. His interests in entomology are the taxonomy and geographical distribution of Scolytidae. Current entomological projects Dr. Mandelshtam is working on are the World-wide revision of the genus Trypophloeus Fairmaire, contribution to the knowledge of several Oriental genera of bark-beetles, and check-lists of Scolytidae for several parts of North-Western Region of Russia. He has published 9 papers on taxonomy and geographical distribution of Scolytidae. The main research activity of Dr. Mandelshtam concerns molecular genetics and epidemiology of two monogenic diseases - familial hypercholesterolemia and familial breast cancer in St. Petersburg, Russia. M.Yu. Mandelshtam is an author of 60 printed matters, including 15 papers on molecular genetics in international and Russian peer-reviewed journals. In 1987 M.Yu. Mandelshtam has graduated from St. Petersburg State University and he has got his Ph.D. degree in 1993 for the research entitled "Molecular genetic study of familial hypercholesterolemia". 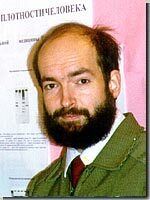 In 1999 he got the award and the medal of the European Academy of Sciences for the cycle of publications on familial hypercholesterolemia in Russia. After participation in the entomological expedition of the Zoological Institute to the Caucasus at school years, Mikhail Mandelshtam can not stop studying his beloved bark-beetles. His own field research and collecting trips were in Northwestern Russia, the Crimea, Northwestern Caucasus and Primorskii Territory (=Ussuri Area) of Russia. At present, Dr. Mandelshtam is working actively with collections of the Zoological Institute and with collections of other Russian and European museums. M.Yu. Mandelshtam is a very communicable person providing high-qualified help with identification of material for many museums and entomologists. All those who need identification of Scolytidae are invited to contact him by e-mail or to send material to the Zoological Institute, St. Petersburg. Mandelshtam M.Yu., Nikitsky N.B., Bibin A.R. The bark-beetles (Coleoptera, Scolytidae) from the subfamilies Hylesininae and Scolytinae (except tribus Xyleborini, Cryphalini, Corthylini) of the Western Caucasus // Bulletin of Moscow Society of Naturalists, Biological Series. 2005a. Vol. 110. Part 2. P. 20 – 30 (in Russian, with English Summary). Mandelshtam M.Yu., Nikitsky N.B., Bibin A.R. The bark-beetles from the tribus Xyleborini, Cryphalini and Corthylini (Coleoptera: Scolytidae, Scolytinae) of Western Caucasus (with notes on some species from other tribus of the family) // Bulletin of Moscow Society of Naturalists, Biological Series. 2005b. Vol. 110. Part 3. P. 21 – 28 (in Russian, with English Summary). Voolma K., Mandelshtam M.Yu., Shcherbakov A.N., Yakovlev E.B., Ounap H., Suda I., Popovichev B.G., Sharapa T.V., Galasjeva T.V., Khairetdinov R.R., Lipatkin V.A., Mozolevskaya E.G. Distribution and spread of bark beetles (Coleoptera: Scolytidae) around the Gulf of Finland: a comparative study with notes on rare species of Estonia, Finland and North-Western Russia // Entomologica Fennica. 2004. Vol. 15, N 4. P. 198 – 210. Mandelshtam M., Danielsson R. Some African Scolytidae (Coleoptera) collected by Swedish Entomological Expeditions // Annals of the Transvaal Museum. 2004. Vol. 41. P. 90 – 92. Mandelshtam M.Yu., Beaver R.A. Amphiscolytus – a new genus, and Amphiscolytini – a new tribe of Scolytidae (Coleoptera) for Dacryophthorus capensis (Schedl). Zootaxa (2003), 298: 1-8. Mandelshtam M.Yu., Korotjaev B.A. New data on systematics and biology of Palaearctic bark beetles of the genus Thamnurgus Eichh. (Coleoptera, Scolytidae). XIIth Congress of the Russian Entomological Society, St.Petersburg, August 19-24, 2002. Abstract book. St. Petersburg, 2002. P. 226-227 (in Russian, without English translation). Mandelshtam M.Ju. New synonymy, new records and lectotype designation in Palaearctic Scolytidae (Coleoptera). Far Eastern Entomologist, 2002. N 119. P. 6-11. Petrov A.V., Mandelshtam M.Ju. New synonymy in the genus Hylesinus Fabricius (Coleoptera: Scolytidae). Far Eastern Entomologist, 2002. N 119. P. 11-12. Mandelshtam M.Ju. Thamnurgus rossicus Alexeev, 1957 (Coleoptera: Scolytidae) – endemic bark-beetle of Central Russia. In: “Vegetation of the Central-Chernozem Nature Reserve”. Proceedings of the Central-Chernozem State Nature Reserve. Issue 18. Tula, 2001. P. 274-278 (in Russian, with the original English summary). Mandelshtam M.Ju., Lafer G.Sh. a. Kuznetsov V.N. To the knowledge of the bark beetles (Coleoptera, Scolytidae) of Sikhote-Alin high mountains. Far Eastern Entomologist, 2001. N 103. - P. 6. Mandelshtam M.Yu. Xylobiont and mycetobiont beetles (Coleoptera) of the Zorinsk area, Central Chernozem Nature Reserve. In: "Natural Conditions and Biological Diversity in the Zorinsk Protected Area in Kursk Province", Transactions of the Central Chernozem State Nature Reserve (N.I. Zolotukhin, editor-in-chief), No 17, Tula, 2001. P. 261-263. (in Russian, no English summary). Mandelshtam M. Yu. New synonymy and new records of Palaearctic Scolytidae (Coleoptera). Zoosystematica Rossica, 2000. Vol. 9. N 1. - P. 203-204. Mandelshtam M.Yu., Popovichev B.G. Annotated List of Bark-Beetles (Coleoptera, Scolytidae) of Leningrad Province. Entomological Review, 2000. Vol. 80. N 8. P. 200-216. (Translated from Entomologicheskoye Obozrenye, 2000. Vol. 79. N 3. P.599-618). Mandelshtam M.Yu. Family Scolytidae - bark-beetles. In: "Flora and Fauna of Nature Reserves", No 69. Beetles and Ants of Lazo Nature Reserve (K.V.Makarov, Ed.) Moscow, 1998. P. 45-50. (In Russian, no English summary). Mandelshtam M.Yu. New data about bark-beetle (Coleoptera, Scolytidae) fauna of Leningrad Province. In: "Problems of Entomology in Russia". Proceedings of XI Congress of Russian Entomological Society (September 23-26, 1997, St.Petersburg) (G.S.Medvedev, Ed.). Zoological Institute, Russian Academy of Sciences, 1998. Vol. 2. P. 23-24. (In Russian, no English summary). Last updated: January 25, 2005.